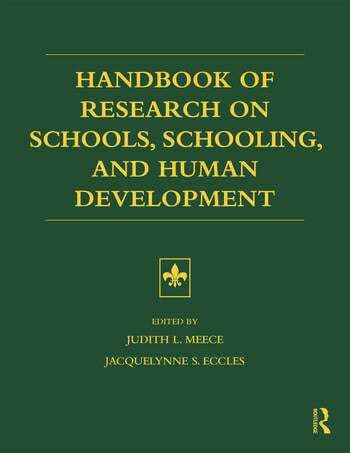 Comprehensive Coverage – this is the first book to provide a comprehensive review of what is known about schools as a context for human development. Topical coverage ranges from theoretical foundations to investigative methodologies and from classroom-level influences such as teacher-student relations to broader influences such as school organization and educational policies. Cross-Disciplinary – this volume brings together the divergent perspectives, methods and findings of scholars from a variety of disciplines, among them educational psychology, developmental psychology, school psychology, social psychology, psychiatry, sociology, and educational policy. Chapter Structure – to ensure continuity, chapter authors describe 1) how schooling influences are conceptualized 2) identify their theoretical and methodological approaches 3) discuss the strengths and weaknesses of existing research and 4) highlight implications for future research, practice, and policy. Methodologies – chapters included in the text feature various methodologies including longitudinal studies, hierarchical linear models, experimental and quasi-experimental designs, and mixed methods. Judith L. Meece (Ph.D., University of Michigan) is Professor and Chair of Human Development and Psychological Studies at the University of North Carolina-CH. She has conducted research in school settings for over 25 years, and was the first scholar to write a child and adolescent textbook specifically aimed at educators. A Fellow of APA Division 15, Meece’s research focuses on the role of classroom and school influences on the development of adolescents’ academic motivation, future aspirations, and educational attainment. Jacquelynne S. Eccles (Ph.D., University of California at Los Angles) is McKeachie/Pintrich Distinguished University Professor of Psychology and Education at the University of Michigan. Her research focuses on gender-role socialization, school influences on academic motivation, and social development in the family and school context. Eccles has served as the president of the Society for Research on Adolescence, and has received numerous awards for her lifetime contributions to research on adolescence and human development.